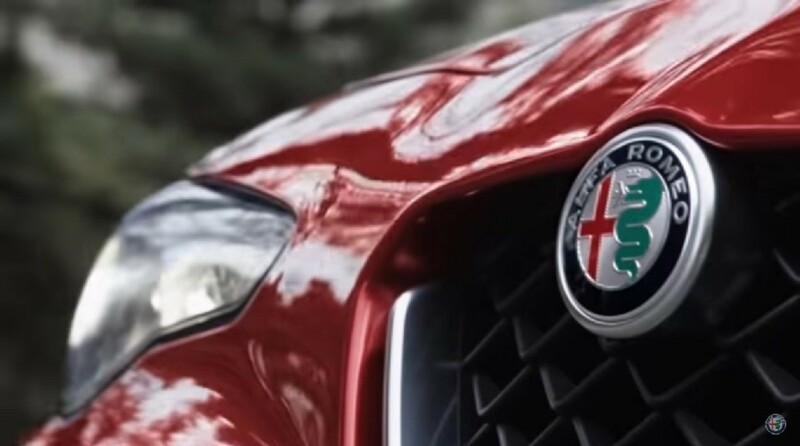 With an engine “inspired by Ferrari technology and technical skills”, the new Alfa Romeo Giulia Quadrifoglio is by far better than other performance vehicle. So we decided to test this statement and took one for a drive to see just how much better the Quadrifoglio is. 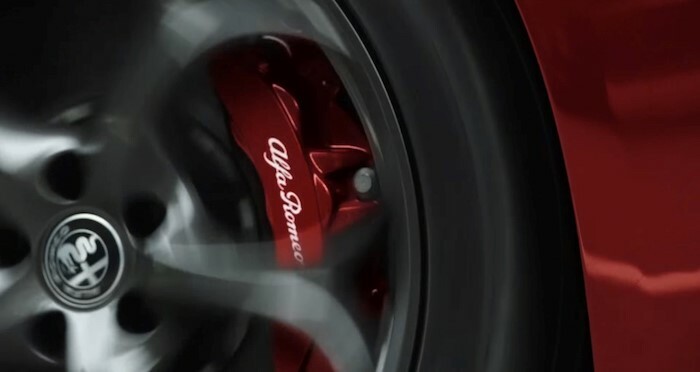 The car is Alfa Romeo’s first new big-volume model in more than 20 years driven by its rear wheels and it also has an industry leading power-to-weight ratio and powerful engine. Predominantly made of high-strength steel, the Quadrifoglio’s platform is modular and will also be used on larger models in the future. Aluminium wings and doors and a carbon fibre bonnet and roof keep the car’s kerb weight down, and there is even an option of having carbon-ceramic brake discs and lightweight seats to lighten the load even more. There is double wishbone suspension up front while a multi-link system is at the rear, in both cases with aluminium sub frames and chassis arms. The Quadrifoglio’s drive comes from a new 2.9-litre twin-turbocharged V6 petrol engine that’s ‘inspired’ by Ferrari’s latest turbo V8s, but which Alfa insists is structurally unrelated to those engines. The vehicle produces maximum outputs of 503bhp and 443lb ft and spins to 7000rpm thanks to an aluminium head and block, a 90deg bank angle, over square cylinders, a cross-plane crankshaft, direct fuel injection and cylinder shutdown technology. Power is added with a carbon fibre prop shaft, an eight-speed torque-converter automatic gearbox and an active torque-vectoring rear drive module with electronically controlled clutches on either side of the differential. 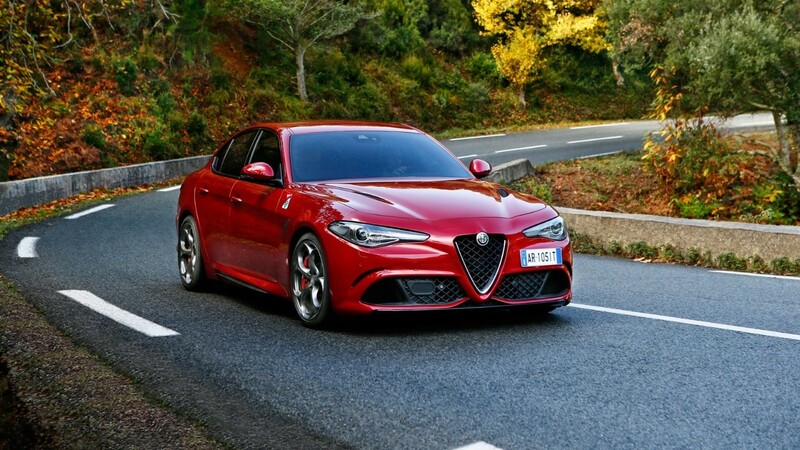 This particular Alfa is smaller and lighter than most of its rivals, with entry-level diesel versions that weigh less than 1400kg without fluids. Thanks to a low-slung, adjustable and well supported sports seats – which are extremely comfortable with extendable cushions and thick side bolsters – the interior is well packaged. We were impressed with the spacious interior, with plenty of room up front and impressive leg room in the rear. But the impression we got of the car’s switchgear, fascia and infotainment system was more mixed. The steering wheel, dashboard and upper door cards are attractive with contrast-stitched leather covers, but this is dampened by the column stalks and other switchgear which look cheap compared to that of the AMG Mercs and RS Audis. Furthermore, the infotainment display is not as sufficiently big-screened or graphically sophisticated as one would expect. The steering wheel carries the red starter which, once pressed, elicits an idle that sounds good, resolutely modern rather than melodious or melancholic, which was music to our ears. The Quadrifoglio has four settings for the rotary ‘DNA Pro’ drive mode selector: Dynamic, Natural, Advanced Efficiency and Race. Race mode deactivates the car’s electronic aids completely, and prepares the engine, transmission, steering, brakes and rear differential for track work. The adaptive dampers are controlled separately, via a toggle button on top of the rotary knob. The Alfa has form for overly direct steering thanks to its modern performance machinery, and also that Ferrari chassis engineers have been involved in the development process. Luckily, the Quadrifoglio didn’t actually feel all that directionally sensitive – at least not after we spent a few minutes or so in it. The double-wishbone front suspension allows for good camber control, as well as very little wheel scrub, leaving the front wheels free to move and giving the power steering less initial friction to deal with. So while the steering begins to feel a bit light off-centre, it’s got good centre-feel, and while it woke us up at first with its incisiveness, we soon learnt to process and adapt to it. Body control is very well judged. Over the track the suspension felt decently quiet and absorptive, and body roll was tight and effortlessly reined in. The Quadrifoglio makes good on the promise of that rear-driven chassis, with a delicately sweet handling balance, and succeeds with a beguiling kind of handling adjustability. But even after all these positives, there were one or two issues we found which won’t allow an M3 to be brushed aside. The biggest issue being that the Alfa’s eight-speed auto ’box isn’t quite on the BMW’s level for shift speed, which was immediately noticeable by the slurring upshifts at times. The car’s V6 doesn’t always feel like a true 500bhp operator either. 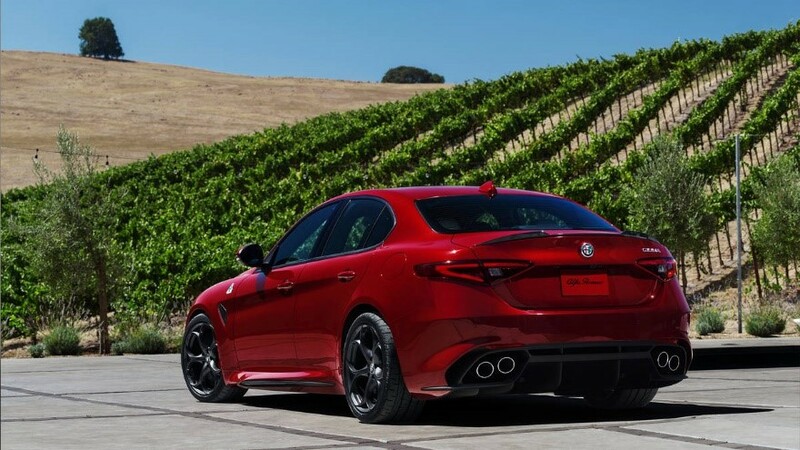 Where it really matters, on handling appeal, we found the Giulia Quadrifoglio to have those qualities in abundance. Yet it remains to be seen if they will hold their own against competitors such as the M3.